1. Column Protection — See Design No. X524 for column protection. 2. Girts — "Z" shape girts fabricated from 0.056 to 0.120 in. thick steel. Girts shall be 6 to 10 in. deep with 2-1/2 to 3 in. flanges. 3. Girt Clips — Fabricated from min 0.115 in. thick steel, angles may be bolted to columns with 1/2 by 1-1/2 in. bolts and nuts or may be plates shop-welded to columns. 4. Floor and Ceiling Runners — (Not Shown) — Top and bottom runners of wall assembly shall consist of channel shaped, min No. 20 GSG or MSG, cold-formed corrosion protected steel members. Attached to floor and ceiling assemblies with steel fasteners spaced not greater than 24 in. OC. 5. Studs — Channel shaped, min 3-5/8 in. wide, min No. 20 GSG or MSG, cold-formed corrosion-protected steel studs.The max stud spacing of wall assembly shall not exceed 16 in. The studs are secured to the girts, floor and ceiling runners. 6. Lateral Support Members — (Not Shown) — Where required for lateral supports of studs, support may be provided by means of steel straps, channels or similar means. 7. Gypsum Board* — Nom. 5/8 in. thick, 4 ft wide gypsum llboard applied vertically with joints between multilayers staggered. For 1 Hr Rating — One layer of gypsum board fastened to studs with 1 in. long Type S-12 self-drilling self-tapping bugle head steel screws spaced 12 in. OC. For 2 Hr Rating — First layer of gypsum board fastened to studs same as 1 Hr. Second layer of gypsum board fastened to studs with 1-5/8 in. long Type S-12 self-drilling self-tapping bugle head steel screws spaced 12 in. OC. 7A. Gypsum Board* — — (As an alternate to Item 7) — Nominal 5/8 in. thick, 4 ft wide panels, secured as described in Item 7. 7B. 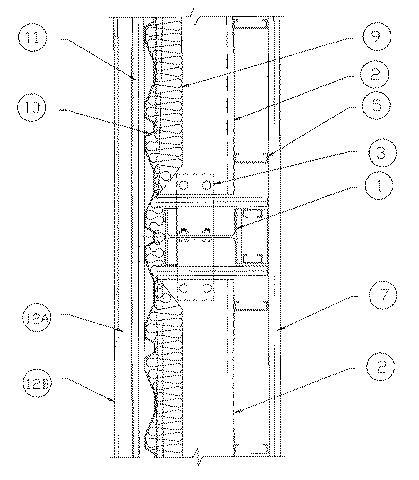 Wall and Partition Facings and Accessories* — (As an alternate to Item 7 and 7A) — Composite Gypsum Panel — Nominal 5/8 in. thick, 4 ft wide panels, secured as described in Item 7. 8. Joint Tape and Compound — Vinyl or casein, dry or premixed joint compound applied in two coats to joints and screw heads. Perforated paper tape, 2 in. wide, embedded in first layer of compound over all joints of outer layer. 8A. Gypsum Board* — (As an alternate to Item 7) - 5/8 in. thick, 4 ft. wide, paper surfaced, applied vertically and fastened to the studs and plates. For 1 Hr Rating — One layer of wallboard fastened to studs with 1 in. long Type S-12 self-drilling self-tapping bugle head steel screws spaced 8 in. OC. For 2 Hr Rating — First layer of wallboard fastened to studs same as 1 Hr. Second layer of wallboard fastened to studs with 1-5/8 in. long Type S-12 self-drilling self-tapping bugle head steel screws spaced 12 in. OC. 9. Batts and Blankets* — Placed between the girts and the steel wall panels. Nom 4 in. thickness of glass fiber or mineral wool batt material bearing the UL Classification Marking as to Fire Resistance. 9B. Fiber, Sprayed* — As an alternate to Batts and Blankets (Item 9) - Spray applied cellulose fiber. The fiber is applied with water to completely fill the enclosed cavity in accordance with the application instructions supplied with the product. The minimum dry density shall be 4.30 lbs/ft3. 10. Wall and Partition Facings and Accessories* — Steel wall panels — Steel min No. 26 MSG, 36 in. wide and 1 in. deep. Fastened to structural supports with No. 12 by 7/8 in. long self-drilling, self-tapping steel screws spaced 6 in. at top and bottom and 12 in. OC at the intermediate girts. 11. Gypsum Board* — For exterior walls, nom. 5/8 in. thick, 4 ft wide exterior gypsum sheathing applied vertically with joints between multilayers staggered. For 1 Hr Rating — One layer of gypsum sheathing fastened to steel wall panels with 1 in. long Type S-12 self-drilling self-tapping bugle head steel screws spaced 12 in. OC. For 2 Hr Rating — First layer of gypsum sheathing fastened to studs same as 1 Hr. Second layer of gypsum sheathing fastened to steel wall panels with 1-5/8 in. long Type S-12 self-drilling self-tapping bugle head steel screws spaced 12 in. OC. A. Foamed Plastics* — Nom 1-1/2 in. thick polystyrene boards attached to steel wall panels with 2-7/8 or 3-1/2 in. long by 1/4 in. diam shank steel screws with 1-3/4 in. diam plastic washers with caps. See Foamed Plastic (CCVW) Category for names of Classified Companies. B. Synthetic Stucco — A synthetic stucco attached to the polystyrene boards and meeting the requirements of local code agencies.